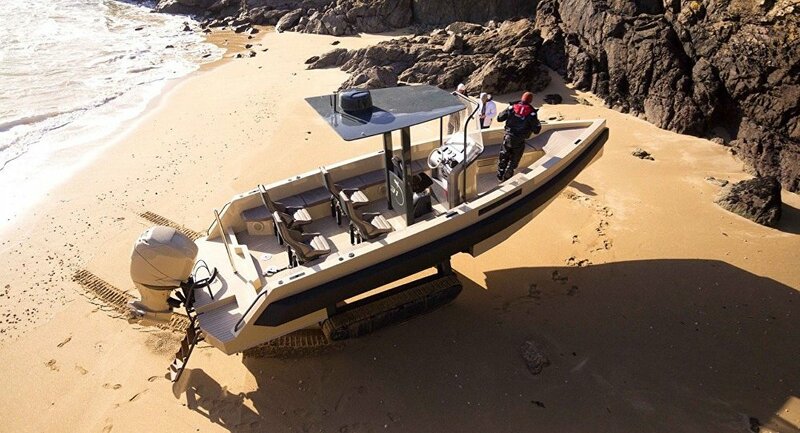 The Iguana 31 amphibious yacht, unveiled by the French boat manufacturer Iguana Yachts at the Milipol Expo in Paris, is a real Godsend for police and military forces as it can sail, move on land and even be used as an-all terrain vehicle. The 9.2-meter-long (30 feet) Iguana 31 is a fast and efficient boat reaching speeds of up to 45 knots (51.5 miles an hour) on water and up to 6.8 miles an hour on land. What makes it really unique, however, are a pair of retractable rubber tracks allowing it the freedom to access any terrain along the coastline without compromising its water performance and ensuring its unparalleled adeptness on all terrains. A 270-liter (71-gallon) fuel tank ensures 115 miles of unrefueled movement on water for the amphibious yacht which boasts a maximum carrying capacity of up to 800 kilograms (1,763 pounds). The smaller, Iguana 29, previously built by the Iguana Yachts company, are used as tender yachts and day boats for owners of beach villas enabling them to go directly from the garden to the water. In July, Russia unveiled its all-new Triton all-terrain flying amphibious vehicle, designed to help emergency service personnel swiftly traverse rough terrain areas, and can operate in various settings. Jointly developed by the Aerospace Technologies Association and Elektroavtomatika Company, the two-seat Triton can reach a speed of up to 100 kilometers (62 miles an hour) on land. The vehicle can navigate virtually all types of terrain and glide across all types of watery obstacles. It can also deploy a flex-wing to conduct short range flights of up to 400 kilometers (250 miles), with a maximum altitude of up to 4,200 meters (2.5 miles). The Triton is equipped with a 120 hp diesel engine which is used to propel the vehicle in flight and while navigating bodies of water, and two 12 kW electric engines for driving on solid ground. The Triton flying amphibious SUV was first presented to the public at the MAKS 2017 airshow and has already attracted considerable attention from the military, law enforcement agencies and emergency services.